Cardiac NO-activated pathways are discussed to involve cross-talk between cGMP and cAMP signalling [1, 2]. Here we have investigated the signalling pathways relating to NO-donor S-nitroso-N-acetylpenicillamine (SNAP) modulation of L-type Ca2+ current (ICa,L) in human right atrial cardiomyocytes. Experiments were performed on human biopsy tissue from 62 patients in sinus rhythm. ICa,L was measured with whole-cell voltage-clamp technique. Application of SNAP (100µM) increased basal ICa,L from 5.93±0.23 pA/pF to 9.10±0.45pA/pF (p<0.001, n/N=117/62). The effect was abolished by inhibition of soluble guanylate cyclase (sGC) with ODQ (30µM), suggesting involvement of cGMP. Stimulator of sGC (BAY 41-2272, 10nM–10µM) also increased ICa,L and this effect was potentiated in the presence of SNAP. Direct activation of protein kinase G (PKG) with 8-Br-cGMP (100 µM, intracellular application) increased basal ICa,L. However, not only cGMP but also cAMP was involved, because, the effect of SNAP on ICa,L was prevented with the protein kinase A blocker (Rp-8-Br-cAMP 1 mM, intracellular). Thus, cGMP may activate ICa,L via direct activation of PKG and indirect activation of PKA at the same time. It is known, that cAMP-mediated activation of PKA is regulated by cGMP via modulation of phosphodiesterases (PDEs). The selective PDE2 inhibitor EHNA (10µM) did not affect basal or SNAP-stimulated ICa,L, therefore PDE2 does not regulate basal cAMP level. 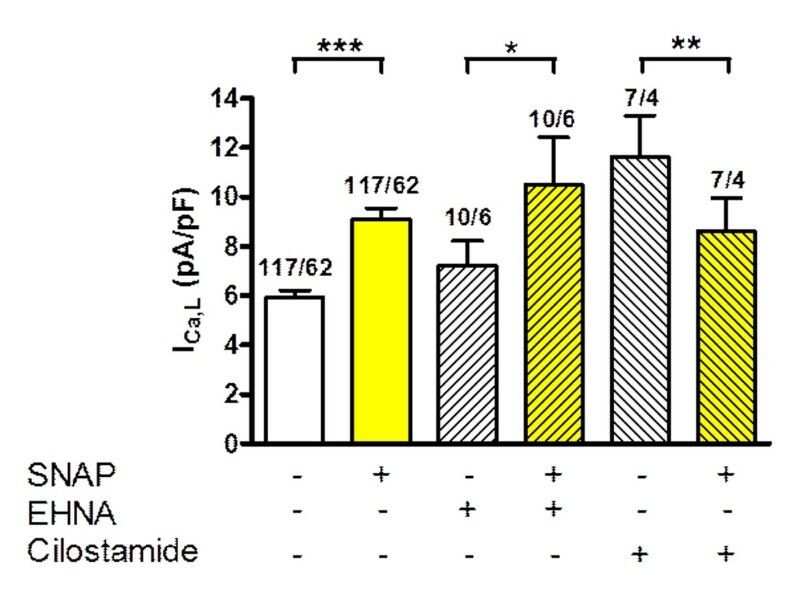 In contrast, PDE3 inhibition with cilostamide (1µM) increased basal ICa,L, suggesting that PDE3 is involved in basal cAMP level regulation. Interestingly, the cilostamide-induced increase in ICa,L is blunted upon addition of SNAP, most probably via activation of PDE2 by SNAP-mediated cGMP increase (Figure 1). Similarly, SNAP blunted enhancement of ICa,L by PKA activation with isoprenalin (1µM; 18.07 ± 1.12 pA/pF vs 23.06 ± 1.36 pA/pF, p<0.001, n/N=21-39/18), however, this effect was prevented by PDE2 inhibition with EHNA. Effect of SNAP (100µM), PDE2 inhibitor (EHNA, 10µM) and PDE3 inhibitor (Cilostamide, 1µM) on ICa,L. SNAP effect in the presence of cilostamide. We conclude that in human atrial cardiomyocytes NO-donors stimulate production of cGMP with further cross-talk to cAMP via PDE2 and PDE3.